Today, Linux has become the most popular real-time operating system. Due to its deterministic hard real-time behavior, sophisticated development tools and broad hardware driver and software support, it is used by leading manufacturers of industrial con-trollers. Typical applications are PLC, Motion Control and Numeric Control systems with high real-time requirements. Using the LxWin Hypervisor it is possible to run Windows and an extremely fast, real-time Linux in parallel. Plenty of Linux drivers, e.g. for fieldbus controllers or GigE camera systems, communication stacks (EtherCAT, Profinet, OPC, OPC UA, TSN, ...) or complex software solutions like CNC controller or software PLCs can be used without any change under LxWin. 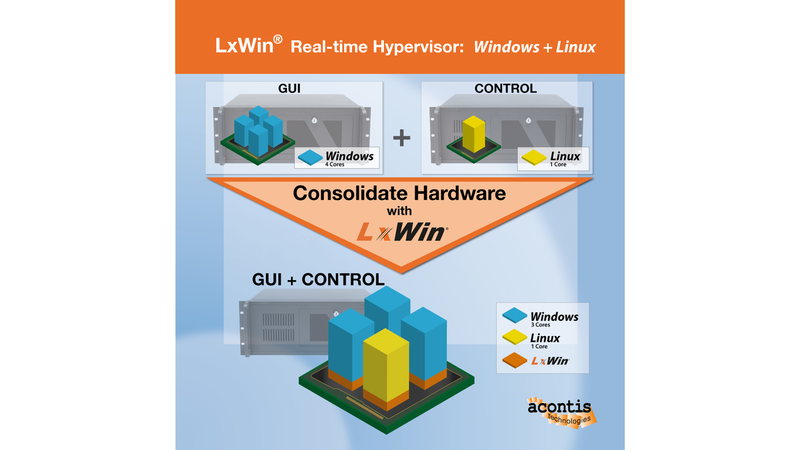 In case customer&apos;s current solution is split into 2 different parts using a Windows based GUI system and a Linux based controller, LxWin is the way to consolidate such solution on one single hardware. Eclipse or Microsoft Visual Studio (starting at VS 2015) can be used for software development.